Career: Built as cargo ship DANEFOLK by A/S Rodby Havns Jernskibs at Rodby Havn. 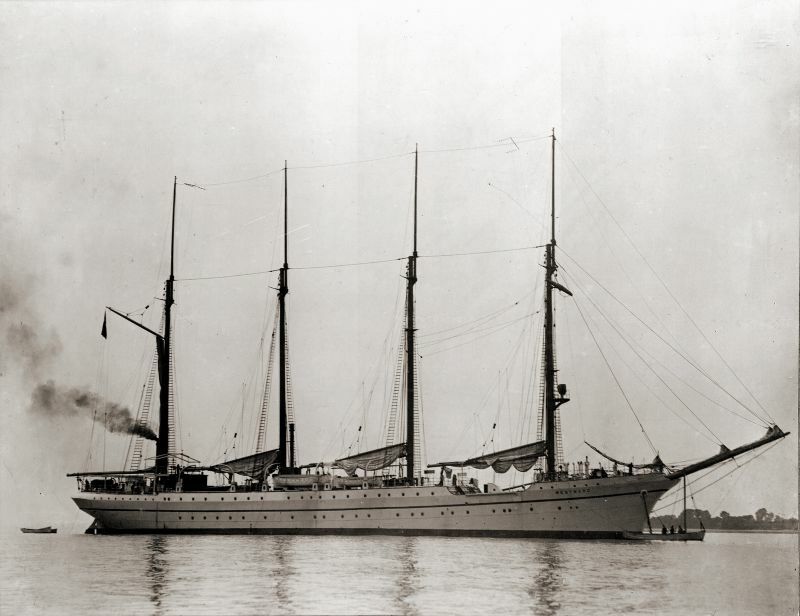 Four-masted twin screw steel schooner, owned by Suenson & Jespersen, Copenhagen. c1924 Sold to M A Robinson, registered in London. 1925 September - advertised to make a round the world cruise from Southampton. 1939 taken to Harwich, renamed BADGER, part of shore-base HMS BADGER, and used to accommodate naval personnel and stores. She remained in Harwich for the duration of the War. "Moored at the eastern end of Parkeston Quay, Harwich, to serve as a depot and rest ship for the East coast corvettes of the "Duck" class: SHELDRAKE, PUFFIN, MALLARD etc., and was renamed by the Navy HMS BADGER. "While I was stationed at Harwich, the BADGER retained her four poles and her hull was painted black except for the bow extended beyond the quay, which was painted white or pale grey. The reason for this, I believe, was a sort of camouflage. The BADGER figures in the background of a number of my war-time paintings. - P.A. Vicary of Cromer, letter to Sea Breezes published August 1961. Vol. 32 page 147. 1946-c1949 moored off Bradwell, as mentioned in The Salty Shore and in John Leather notes. 7 April 1947 Jeff Curtiss records her off Bradwell, in grey, sails removed, no bowsprit. 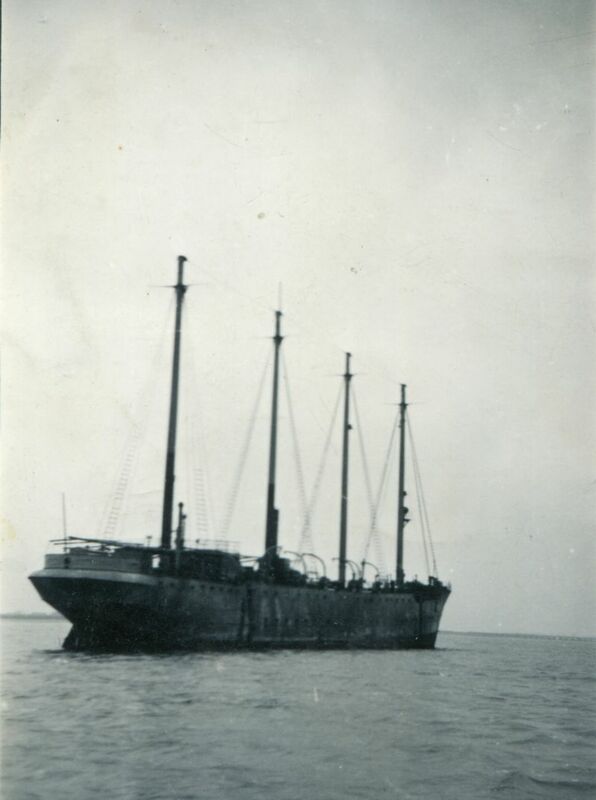 c1948 purchased by the Crown Development Corp. Towed to Grimsby and converted to a fish factory vessel ( now two masts and one funnel ) by Doig of Grimsby. - 24 January 1947 BADGER Compensation 7 wks 1 day, Director of S.G. Disposals. - 24 May 1948 BADGER compensation 2 wks 2 days. H.E. Moss & Co. (agents). Above: Auxiliary schooner WESTWARD. It is not known where this picture was taken but would be 1924 to 1939. She was at Harwich as HMS BADGER during WW2 and was moored off Bradwell 1946-c1949 Official No. 148556, ex DANEFOLK, built 1920, 2,001 tons gross. Date: 1930s. Above: Thought to be the schooner WESTWARD / BADGER when she was in the River Blackwater. She was at Harwich as HMS BADGER during WW2 and was moored off Bradwell 1946-c1949 Official No. 148556, ex DANEFOLK, built 1920, 2,001 tons gross. Date: c1948.